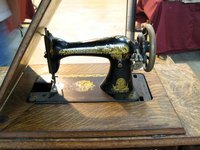 Antique treadle sewing machines are a favorite collectible item, especially the Singer models. After a few decades of neglect, these machines may work just fine with tinkering and adjusting. However, their fine wood cabinets may look the worse for wear. Many times, the Singer treadles' cabinets on require some gentle cleaning and waxing to regain their beauty. There are some that are so badly deteriorated that only a total refinishing will help. Removal of the old varnishes and shellacs tends to diminish their monetary value for collectors. Dampen a soft cloth with a solution of liquid oil soap and water. Wipe the surfaces of the cabinet pieces to remove superficial dirt and then dry them with another towel. Follow up with a thorough rub-down with a cloth saturated with a scratch remover. Allow it to work for a few minutes and then wipe off the excess with a soft cloth. Repeat the above process using the finish restorative intended for use on antiques. Apply this with a soft cloth, rub it on the entire surface, let set very briefly, then wipe off with a clean cloth. This step softens the old finish without removing it, allowing it to flow into any holes or scratches. Wipe off any excess restorative immediately. Saturate a clean cloth with the wood restorative and wax. Rub liberal amounts of it into the wood. Allow to soak into the wood for 20 minutes, wipe off any excess, and buff the finish to a high shine. Repeat this process again in a week, again in two weeks, and then again at four to six week intervals. Disassemble the entire cabinet if you find it necessary to refinish the wood rather than just restore it. Remove surface dirt using a mixture of oil soap and water with a clean cloth. Put on your latex gloves to protect your hands from harsh chemicals. Apply a furniture stripper intended for use on antique wood with a disposable paint brush. Allow to set for 10 to 20 minutes, then use coarse steel wool and rough rags to begin removing the old finish. Use fine steel wool to remove any remaining stripper and old finish that may be lurking in the cabinet pieces' crevices. Work gently to avoid damaging the wood. Finish with a rinse with plain water using the least amount necessary to wash away any stripper and old finish. Apply tung oil to the surfaces of the cabinet pieces, allowing it to soak in for a few minutes, wiping off the excess, and buffing to a shine. This may require repeating. Other stains and finishes may be used, but tung oil doesn't hide the grain and beauty of the wood like these do. High-quality wood care products are often sold in antiques stores and cooperatives. With old wood, gentler is better. Use the most dilute stripper that will get the job done. Refinishing an antique Singer treadle machine usually diminishes its value to collectors. Use special care around any decals on the cabinet or treadle head itself. Avoid those areas when using a stripper or restorative.